My son, Michael Bennett was wheeled in to the Pre-Op room at about 8:30 AM. His nervous excitement and uneasy playfulness was on glorious display for all to see. He was literally turning flips in his bed as anesthesiologists laid out their plan for putting him under. He was about to undergo another surgery. In times like this I often catch myself looking into my wife’s eyes, as we both silently communicate our anxiety and nervousness, apprehensive to speak it out loud for fear of communicating anything but confidence. But MB is too cleaver. He understands the subtle language of hospitals better than most. With a dose of Versed administered through MB’s IV, he goes from ball of lighting to a chilled sunset in a matter of seconds. His eyes roll back and he gives us an odd and an uneasy smile. We kiss his forehead and squeeze his hands while fighting back tears. With his favorite stuffed friend, ‘bear’, at his side, he is wheeled away under the trust of surgeons and God and disappears beyond swinging doors. My son has complex medical issues. He has had them from birth and we adopted him with a pretty clear understanding of those challenges. They have been hard, they have been a struggle at times, but they have never been what define him as our boy nor or as a human for that matter. For Michael Bennett, they are as much a part of him as anything else. We have learned over the three years we have held our boy, that he is blessed and that he is a blessing to all of us. Having traveled the hallways of hospitals, one gains perspective, one becomes humbled, and one gains a deeper understanding of life, no matter what physical condition your skin lives in. It is that gift of perspective that now provides me with much peace in my life. This idea of perspective really slapped me upside the head over two years ago in a Hospital in Cincinnati, Ohio. Shortly after his adoption, we had traveled to Cincinnati Children’s Hospital for a crucial surgery. Michael’s medical needs and operations were new to us then and overwhelming, to say the least. I was personally feeling depressed about his condition and self-consumed by the complexity of his needs. Upon leaving the Cincinnati hospital room to run an errand one day, I entered the elevator for the lobby. Just as the doors closed a gentleman sharing the ride asked me, “What is your child here for?” I told him surgery to correct a birth defect. I told him how difficult our road had been and how hard it was to see him go though so much. I was feeling sorry for myself, for my boy, my family, and our situation. The man looked at me understandingly and told me it would be alright and that the doctors at the hospital were the best. I returned the volley and asked him why he was here. He paused for several moments and replied solemnly, “My 10 year old daughter has had two separate organ transplants. The first had not taken and the second was being rejected”. I could see tears well in his eyes. He continued, “…she will probably not live past the week. Her body just wont accept the transplant.” (Enter perspective). There are few things in life that a father does not want to face. At the top of that list has to be the prospects of seeing your child die. It was in that moment, with that father, that I came to actualize a more profound understanding of perspective. While Michael Bennett’s medical issues where complex, they weren’t that father’s and they aren’t the the problems of so many others whose stories are unique to their own family – often times more dire than ours. Earlier this summer, I caught a plane from Boston where I said goodbye to Michael Bennett and my best friend, wife and hero, Peggy. She and Michael Bennet remained there at Boston Children’s Hospital for three more weeks, completing the recovery from that important and successful surgery on June 7. Upon leaving the hospital to return home, MB was asked by his doctor what he wanted to do most when he got home. His answer was… to swim. Because of his condition prior to the surgery, MB was never allowed to submerge under water or ‘swim’, for that matter. In a family that has a pool, surfs, and loves being in the water at any chance, it’s been a desire of his since he joined our family. Two weeks ago, we all visited a local swimming hole in Austin called Barton Springs. 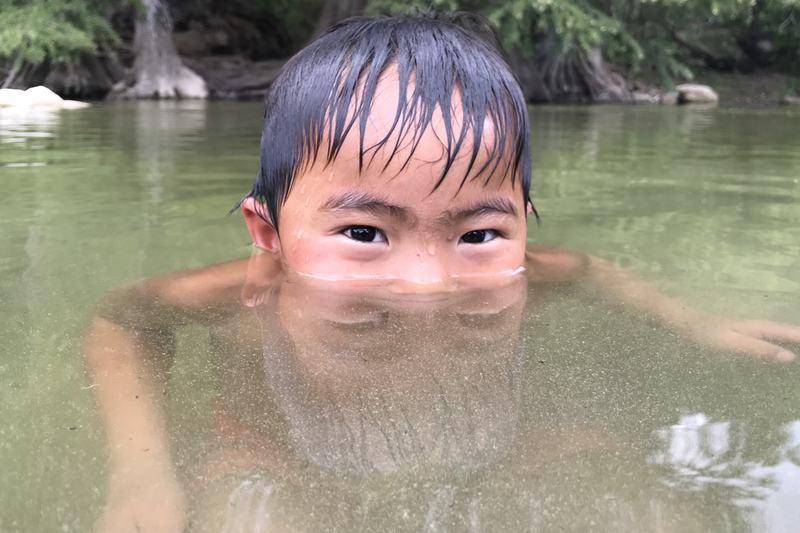 It’s a legendary Austin spot where thousands come to escape the Texas heat in the cold spring waters welling up from below. In the middle of the pool stands a diving board and a long line of patrons taking the plunge into the frigid waters. Of course MB wanted to go! So his big sister Hadley and he took to the back of the line and waited for their turn. When it was Michael’s chance, he climbed up the diving board stairs, walked to the end of the board and motioned to his sister to get out of the way. In the short but spectacular life MB has led so far, he has gone through so much, spent so much time in hospitals, and in moments, struggled to thrive. But on the end of that diving board with hundreds of onlookers joining in to cheer for him, he was free of any pain, any worries, and struggles. And in that special moment, I was reminded of how blessed I was to have him in my life, no matter the hardships, no matter the struggles. He lept from that board, flipped in the air and plunged into the waters below with not an ounce of fear and all the happiness in the world. Everyone has a story unique to themselves and the struggles are great for so many people other than ourselves. It is easy to dwell on our own problems, to allow the challenges of life to bring us down. What MB reminds me, is that we should all focus on the joys of life, the opportunities to live and to be happy. We can choose to drown in our fears, our problems, and our discomfort or we can choose to swim in a greater perspective. For Michael Bennett, the view from the end of that diving board was all the perspective he needed.